The short term effects of moderate alcohol consumption on the brain are quite clear. Regarding the long term effects however, the body of evidence varies by age range. Below the legal purchasing age and when pregnant, it is not sensible to drink alcohol. 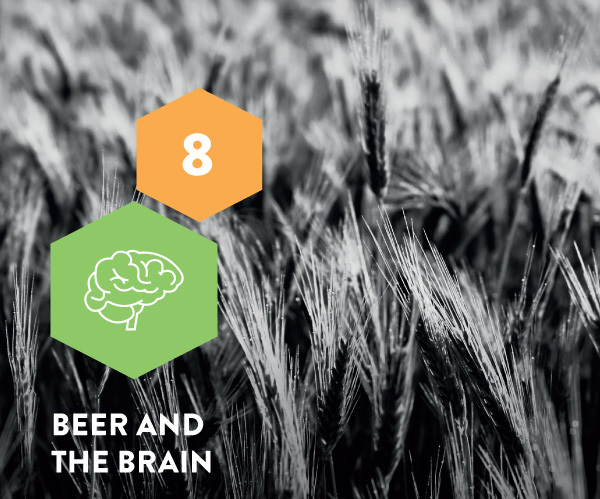 During young adulthood (18–25 years of age), the brain is still developing, though it is not yet clear how moderate alcohol consumption affects the brain during this period of life. The risk of mild cognitive impairment and dementia that is more common later in life, might be reduced with moderate alcohol consumption. All effects on the brain are due to the alcohol in beer and apply to all alcoholic beverages. Up to an age of 25 years old, the brain is developing and might be vulnerable to the effects of alcohol. Until the legal purchasing age and when pregnant, it is not sensible to drink any alcohol. More research is needed to understand the influence of moderate alcohol consumption on the developing brain after the legal purchasing age (16 to 18 years). Moderate alcohol consumption may lower risk of dementia by 26% with the consumption of up to 28 drinks per week, and there might also be a lower risk of mild cognitive decline. Research on the protective effect of alcohol consumption against Parkinson’s disease is very limited. Later in life, the brain undergoes changes that influence its functioning. The normal ageing process of the brain results in cognitive decline. Mild cognitive impairment (MCI) is an ageing process of the brain that is beyond what is expected based on age and educational level. People having MCI may retain the ability to be independent, but of those with MCI, 10–15% develop dementia for reasons that still remain unknown. Dementia is a brain disease causing damage and breakdown of nerve brain cells or the connecting tissue between nerves. This results in cognitive deficits that interfere with independence. There is no agreement on the prevalence rates of MCI in Europe. According to the scientific literature, MCI prevalence rates vary from 3% to 42%, depending on the age and definition of cognitive impairment used. 243 243 In 2015, an estimated 10.5 million of the about 177 million people aged 60 years and over in Europe were suffering from dementia. 244 Several population studies have looked at the association between alcohol consumption and cognitive decline, MCI and dementia. Alcohol reaches the brain approximately 5–10 minutes after consumption.259 Depending on the blood alcohol concentration (BAC) there are different effects on the brain (see Table 6). BAC depends on a number of factors including the rate of consumption, gender and body weight. For example, consumption of 10 g of alcohol by a 80 kg man results in a peak BAC of 0.02%, whereas 10 g of alcohol by a 65 kg woman results in a peak BAC of 0.03% (see Chapter 10). At these BACs, the frontal lobe sedates, inducing relaxation, impaired judgement, and increased heart rate.